Following on from last weeks hi-jinks I am up to my gills in college and work commitments. As a result I am going too have to take a week or two off regular posting. Back when things calm down a bit, in a week or two. I should be able to get some photos taken of some of the newer stuff that I have painted before then too. No “proper” post today Im afraid. I skidded on patch of ice on my way to work this morning (Tuesday), spun 180 degrees and crashed my car into a ditch. Twice. No permanent damage to me (the same cannot be said for my Toyota Corolla), but my enthusiasm for writing about toy soldiers is uncharacteristically absent right now. Thats a rarity for me. Despite the rude intrusion of real life into the reality-free-zone that is this blog, I will be heroically back on schedule on Sunday. I found these figures in the attic of a relatives house last summer. I painted them while I was living there back in 1990 or so when I was fifteen. They are painted to match the colour scheme of my first Space Marine army. The miniatures are the same seriously dodgy Terminators that were supplied with the original Space Hulk box. The figures are undeniably clunky, but have a very functional charm as gaming pieces, from my nostalgia ridden perspective at least. Being as devoid of animation as they are, they are as obviously boardgame pieces as something like the top hat from Monopoly or even a pawn from a cheap set of Snakes and Ladders. 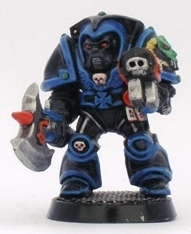 I also found a painted Terminator Librarian from the Deathwing supplement. Another goofy early GW plastic. I got a kick out of finding these figures and I dusted them off ready for a game of Space Hulk or Advanced Space Crusade or something similar in the future. While the paint jobs are a scary twenty years old, they are perfectly fine for gaming with. Funnily enough when I traded on Boardgamegeek for a set of 2nd edition Space Hulk back in 2008 I painted up another batch of the same sculpts, visible here and here. At the time I was going through a sort of minimalist phase in my figure painting and I was trying to see the smallest amount of work required to do to a figure to get it finished well enough to game with. This was mainly in an effort to try to make a serious dent in the lead and plastic mountain and to get some projects (like Space Hulk, Mutant Chronicles: Siege of the Citadel and Descent: Journeys in the Dark) finished for once, at the expense of paint job quality. I found it curious to compare the figures painted in 2008 with the same figures painted eighteen years earlier.